Pitbull grooming, in regards to coat care, is considered an "as-needed" duty. We do, however, recommend weekly brushing for these regular shedders to keep their coats healthy and reduce cleanup. Baths can be given at your discretion as long as a gentle canine shampoo is used. Below are some Pitbull grooming tips for taking care of the task at home. Although this breed requires very little effort to maintain, a weekly brushing is still recommended. They do shed so brushing not only helps to reduce the amount of cleanup you will have to put in but also helps to keep her coat healthy and shiny from the skins natural oils. The best brush for Pitbulls seems to be a rubber curry brush-- most owners say it removes a ton of dead hairs. Other acceptable brushed for Pitbulls include a rubber mitt or "shedding brushes" such as a hair rake (like the Furminator for short hair). Bathing your Pitbull shouldn't be a difficult task. If you were among the many owners wondering "Wow, such a lot of dog! How often should you bathe a Pitbull?" Luckily, their short coats only need a scrub as you deem necessary-- if she looks dirty or starts to smell. The best shampoo for a Pitbull is a gentle canine shampoo (not a people shampoo). 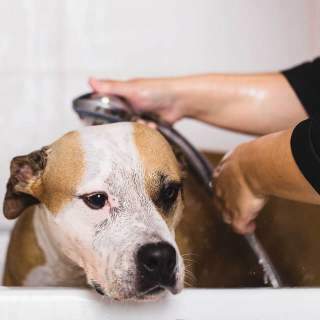 Using a doggy conditioner is also acceptable and so is using a wet cloth or a deodorizer to give them a wipedown in between baths-- these things will help keep their coats shiny! Tip: Have the tub already filled with several inches of warm water before introducing your Pit to the bathtime experience. Also, make sure to brush them before the bath to remove dead hairs. The art of trimming Pitbull nails may take awhile to perfect so your puppy needs to be introduced early. Check his/her nails each month because while some may wear the nails down naturally when playing outdoors, others don't. A guillotine style traditional nail clip will work as will a spinning sanding tool. This will not be your pet's favorite part of grooming so provide lots of praise and treats and, remember, there's no hurry! It's better to take small amounts off at a time than to clip off a large section and cut the quick-- which is painful and results in bleeding. Teeth- Your Pitbull's teeth should be cleaned every week or so. Some experts recommend daily since plaque buildup can lead to a whole host of health issues. This is a serious task that shouldn't be overlooked so if you cannot get your Pitbull dog or puppy's teeth clean with their cooperation, you should schedule regular cleanings with your veterinarian. Ears- While it may be easy to see dirt, debris or mites in dog with cropped ears, make sure you check your Pits ears monthly. Clean with a cotton ball or Qtip soaked is ear cleaning solution (note, do not insert the Qtip inside the ear canal). Whether you have a beautiful Blue Pit or a stunning pink nose Pitbull they all have something in common-- they are very easy to groom! The short, straight coat will stay glossy if they are fed the correct diet and brushed regularly so there's no need to spend time worrying about Pitbull haircuts. If, for any reason, you decide to shave yours be careful not to nick the natural non cut pitbull ears. While we recommend leaving any dog in their natural state, many owners choose to explore different Pitbull ear cropping styles. All 4 styles look similar and in order of increasing length are: the Battle crop, Short Crop, Show Crop and Long Crop. Cropping is done between 7-12 weeks of age and you should check the ears every day for signs of infection.